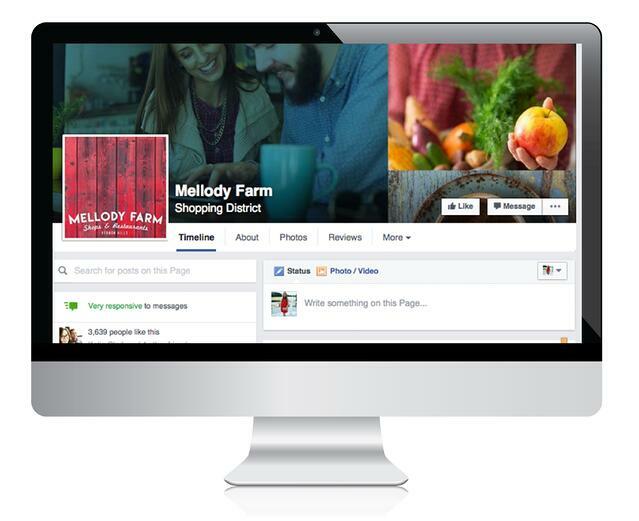 Mellody Farm sits outside of Chicago in Vernon Hills, Illinois. First came the creation of a logo and branding, which pay homage to the history of the site. Next we launched a Facebook page for this exciting development, and it now has more than 3,500 fans. The twist? Mellody Farm is currently a pile of dirt: the mixed-use project with 260 units of planned executive apartments isn’t slated to break ground for almost a year. Our initial strategy was simple — connect to the people of Vernon Hills and start interacting with them online. We accomplished this with a series of themed posts depicting three images accompanied by simple questions around a variety of topics that were universally relatable. We asked people to submit ideas on subjects ranging from materials and open spaces to dining options and date night preferences to fitness routines and creative concepts. Responses rolled in, and we were astounded by the amount of interaction and candid feedback on the page. “Please consider adding more unique, upscale dining restaurants for Italian, Mexican, Japanese, Farm-to-Table, etc.,” commented Linda Peters on a post about date night. Meanwhile on another recent post Necie Edwards asks for ‘comfortable and non smoking outdoor seating with an island vibe full of lush green plants’ in response to a post about outdoor gathering places. While the majority of input has been positive, some has been critical, often creating the opportunity for constructive dialogue. We’ve also gotten countless questions about the project’s timeline, what retailers are coming, how traffic will be configured to alleviate the increase in volume, and others. Some of these are posted on the page and others are sent privately, as direct messages. The page has grown to 3,634 likes since its inception five months ago. Three fourths of people visiting the page do so from a mobile device. Posts with a photo reach approximately 2,439 people whereas posts with a link to an external story or video reach 5,024, according to Facebook analytics. As the development moves forward, we will continue to post project updates and keep our growing audience engaged. 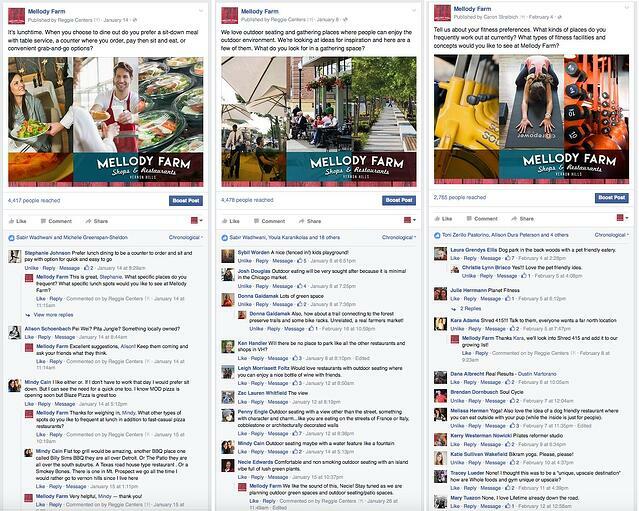 Ultimately, Mellody Farm Facebook fans will become Mellody Farm shoppers, and ambassadors for the project among their friends, family members and co-workers.